Swimming fins can be a nice addition to your sports bag. They can help you learn a new swim stroke or improve your technique. But as there are a few types of swimming fins, it can be interesting to know their uses. That’s the topic of this article. Diving fins used by scuba divers, too long to be useful for regular swimming. Long blade swimming fins have been available for decades, and are still commonly used by swimmers. They are shorter than diving fins but still a bit too long for swimming. Because they provide a lot of propulsion and support for the legs, you can become dependent on them for swimming. Furthermore, they can strain your Achilles’ tendon. 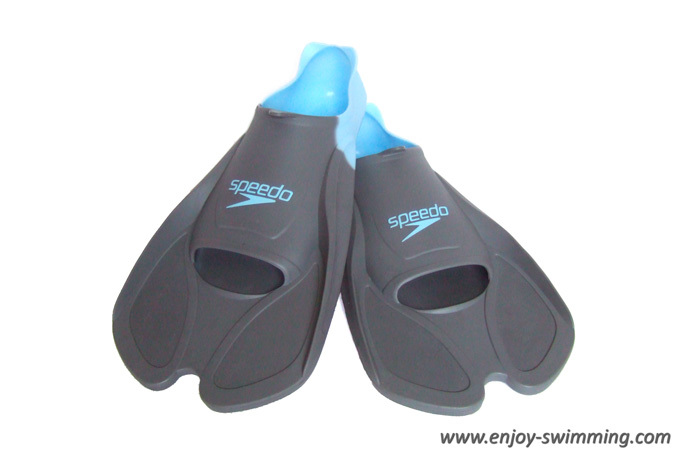 Short blade swimming fins have become popular over the last decade. They provide less propulsion than long blade fins, and as a consequence, your kicking movements are closer to those you do without fins. Those kinds of fins are also gentler on your Achilles’ tendons. Finis Zoomer and Speedo Biofuse are popular short-blade swimming fins. Finis Positive Drive Fins are even shorter and can used to swim breaststroke. I have not used them yet, but online reviews are positive. They can also be used to swim the other swim strokes. Tip: While choosing your fins in a shop, make sure they have a tight fit (without hurting), as swimming fins are always more slippery and loose once you wear them in the water. They can be used to swim laps of front crawl, backstroke, butterfly, and even breaststroke with the aforementioned positive drive fins. Swimming fins allow you to keep your legs up while learning the front crawl or backstroke. It is then easier to concentrate on the other aspects of the stroke. Swimming fins help you learn the dolphin kick in the butterfly stroke. Fins give you propulsion and support your legs while practicing swimming drills. Shorts blade fins can be used in kicking sets to provide a good leg workout. Flexible ankles are a prerequisite for an efficient flutter kick. If you have stiff ankles (for example because you have been running for many years), using fins regularly will stretch and loosen your ankles. Swimming fins can help you become a better swimmer. Use them in moderation, as a tool to improve your technique and not as a crutch to compensate for bad technique! Short-blade swim fins are also very useful for Sidestroke and Combat Swimmer’s Stroke.